Sean Lynch fights for the ball. The sophomore midfielder scored the only goal in the Wildcats’ 1-0 win over Illinois-Chicago. 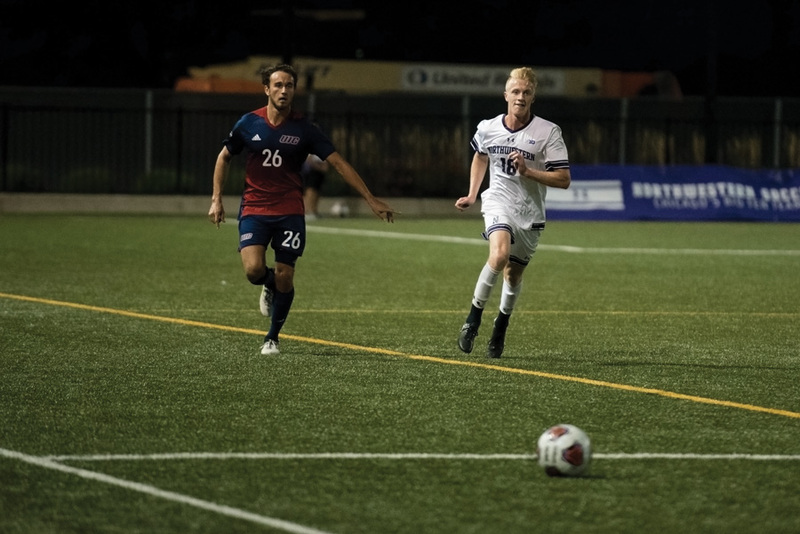 Nearly a month after Northwestern had last won a game — and 235 minutes after it had last scored — Sean Lynch provided the moment the Wildcats had long awaited. Lynch’s header off a Camden Buescher free kick in the 87th minute bounced past Illinois-Chicago goalkeeper Sokratis Vasilas and into the net, giving NU (2-6, 0-3 Big Ten) the taste of victory with a 1-0 win over the Flames on Wednesday night. Having lost six straight games entering the contest, the Cats finally drew a beatable opponent in the Flames (1-5-1) this week and, with a sense of urgency settling in, took over the game in the final 15 minutes. Senior forward Elo Ozumba had a pair of chances and sophomore midfielder Mattias Tomasino created a close look that Vasilas saved, but NU continued to press and eventually drew the free kick — one of 21 fouls UIC committed, as opposed to just 12 by the Cats — that Lynch and Buescher converted. After taking the lead, junior goalkeeper Robbie White, making only his second career start, was forced to make a pair of saves in the closing minutes — one a well-struck free kick right at him, the other an acrobatic dive to his left to deflect away a header — to preserve the win. Slow starts had been an issue throughout NU’s losing streak, falling behind by the 10th minute in each of its last four matches, and Lynch said the team prioritized a fast start in front of Wednesday’s sizeable crowd. The Cats used a steady breeze blowing their direction in the first half to achieve that, failing to score a goal but drawing several corners and an Ozumba opportunity within the opening minutes. Tomasino then nearly gave the hosts the lead in the 21st minute with a free kick from 27 yards that ricocheted off the crossbar. Coach Tim Lenahan attributed his team’s improved start to a change in approach. “We took a little more businesslike approach today than we had, in terms of not doing as much rah-rah stuff, and let our effort on the field talk for itself,” Lenahan said. That effort continued all night long, as NU totaled nine corners, five shots on goal and — ultimately — a win. After the game, Lenahan resisted describing the victory as a watershed moment for the team, instead attributing their recent struggles more to the difficult schedule they’ve played. Nevertheless, he did concede seeing a go-getter mentality in the Cats on Wednesday.